A free website supports this book. It provides up-to-the-minute information and online solar energy calculators to help simplify the cost analysis and design of your solar electric system. The online project analysis tool on this site takes away a lot of the calculations that are involved with designing a new solar electric system, including estimating the size and type of solar panel, the size and type of battery, the thickness of low-voltage cable required and providing cost and timescale estimates. To use the online project analysis, you will need to have completed your power analysis (see the chapter on Project Scoping), and ideally completed your whole project scope. The solar calculator will factor in the system inefficiencies and produce a thirteen-page analysis for your project. Monthly solar insolation figures for every country in the world are included on the website. These can be accessed by selecting your country and the name of your nearest town or city from a list. Every country in the world is included. The solar insolation figures used are monthly averages based on three-hourly samples taken over a 22-year period. The solar angle calculator shows the optimum angle for your solar panel on a month-by-month basis, and shows where the sun will rise and set at different times of the year. A directory of solar suppliers is included on the website, along with links for finding out the very latest about grant schemes and selling your electricity back to the electricity companies. The site includes an extensive list of questions posted on the site by other site visitors, along with my answers. These questions and answers cover almost every conceivable area of solar design and installation and are worth a browse. If you have a question of your own, post it on the site. If you have noticed a mistake in the book, or feel a topic has not been covered in enough detail, I would welcome your feedback. This handbook is updated on a yearly basis and any suggestions you have for the next edition would be gratefully received. The website also includes an ‘ask me a question’ facility, so you can get in touch with any other questions you may have, or simply browse through the questions and answers in the Frequently Asked Questions section. 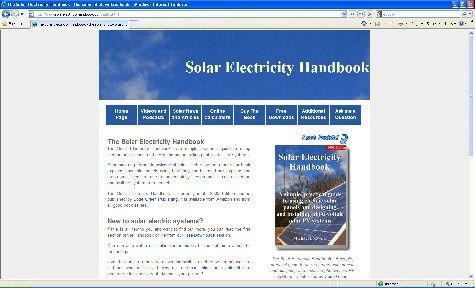 New articles about solar power are regularly added to our articles section.